Within minutes of meeting Tess and Alan over coffee a few months ago, I knew their Nashville wedding at The Hermitage Hotel was going to be something special. Instead of planning a large event with lots of guests, they had other ideas. Their plan, they explained was to have a spectacular, intimate celebration surrounded by their closest friends and family. Let’s face it–it’s hard to imagine a backdrop with more panache than the iconic Hermitage. Anyone who has visited here knows that it is one of Nashville’s most treasured landmarks with a rich, distinctive history. Built in 1908, its distinctive Beaux-Arts architectural style hails both Italian and French Renaissance architecture. As a five-star wedding venue, many considered it second to none in Music City. The grandeur of The Hermitage sets the stage for a once-in-a-lifetime experience the moment you step in the door. Tess and Alan checked into their wedding suite shortly after noon, and spent the next few hours in separate getting-ready rooms. This is the time of day I most enjoy, truth be told! It makes my journalist’s heart happy to documented the fun, anticipatory photos that set the stage for the rest of the day. They did not plan to see each other before the ceremony, which added to the excitement and emotion of the afternoon. 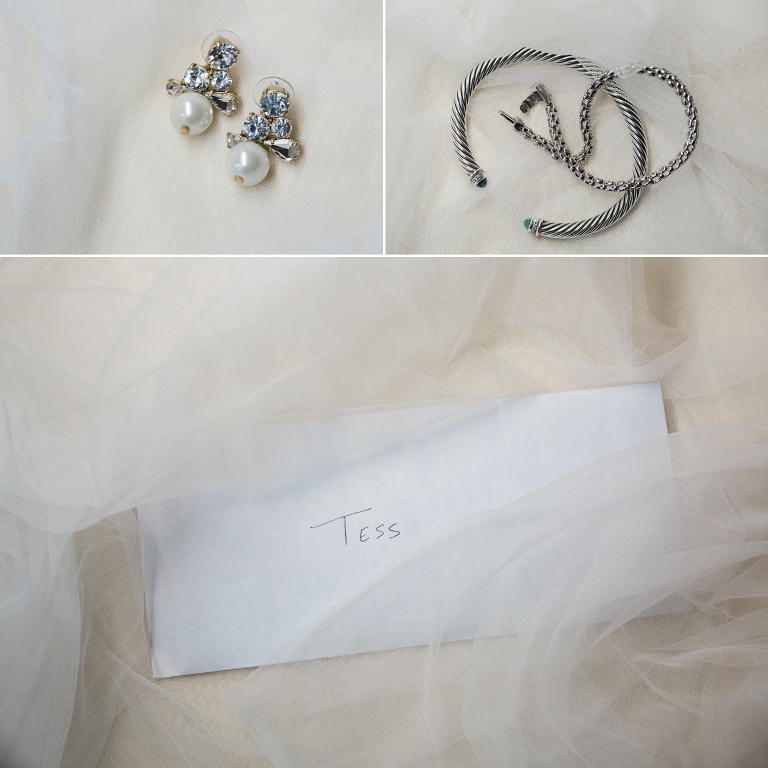 As the bride’s mom and two sisters sipped champagne, Tess’s wedding hair and makeup were beautifully styled. Once complete, she was dazzling! Luckily, before she got dressed, we had time to capture some fun “PJ pics” of the girls. Afterward Tess’s mom and sisters laughed and giggled as they sweetly helped Tess into her dress, shoes, and jewelry. (Funny story: One of Tess’s sisters is an identical twin, so when I first arrived, I gave her a big hug and said “Congratulations!”– only to find out I’d just hugged the wrong sister! Turns out, the groom’s mom did the same thing! So at least I didn’t feel TOO ridiculous, haha). After the girls’ formal portraits were complete, I popped in the groom’s suite to capture their preparations as well. In most cases, guys typically don’t take as long as girls for their actual getting ready. But– it’s just as important to capture the groom’s perspective! I love photos showing the men helping each other with ties and cufflinks, sharing old stories and breaking the tension with jokes and perhaps a few drinks. These will always be a part of my wedding galleries! 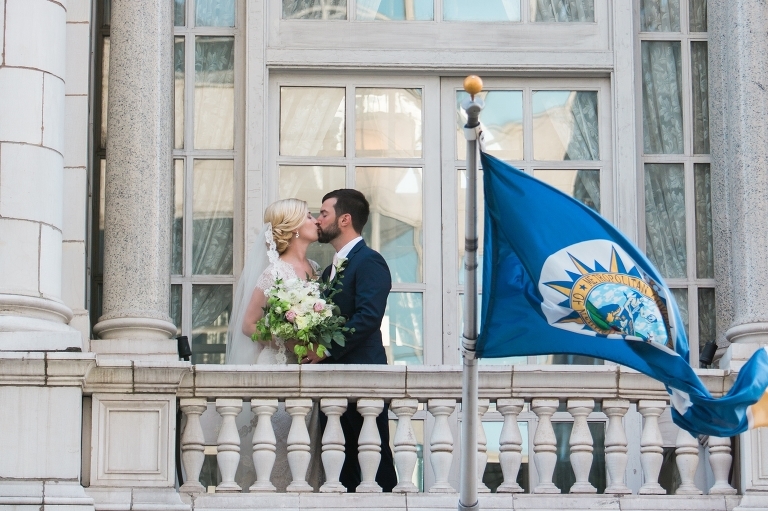 Tess and Alan held their emotional wedding ceremony in the gorgeous Veranda space in the Hermitage Hotel, overlooking 6th Avenue. Afterward, we stepped outside on the balcony for romantic wedding portraits. In most cases, I seek out beautiful, natural settings to photograph wedding portraits. But when one gets married in downtown Nashville at The Hermitage, its unique and bold architecture demands a starring role! I love how the photo above juxtaposes the grandeur of the hotel with the loving intimacy of the couple. This is how I try to weave compositional elements together to tell a unique wedding day story. The perfect cap on the day came when we wandered across 6th Avenue to shoot a few romantic bride and groom portraits. The day was warm but not horrendous, and the rain earlier in the day made puddles we had to sidestep. Inside my head, I was fearful that my desire to capture sunset portraits would be ruined by the downtown skyscape, as well as the earlier clouds. But thankfully, I could not have been more wrong! Just as I positioned Tess and Alan on the corner of 6th & Union the sun burst over the Legislative Plaza hill. Check out the beautiful golden light and the soft romantic glow it created on this happy couple. Congratulations to Tess and Alan for their spectacularly chic and intimate wedding at The Hermitage Hotel. It’s one I will not soon forget!